Deliver a seamless stellar end user experience by proactively monitoring your web apps, mobile optimized websites, responsive design webpages, as well as the underlying APIs. Designing and optimizing mobile apps and websites is a key element of brand innovation, but continuously innovating and following through on delivery requires insight into end user experience in a real browser. 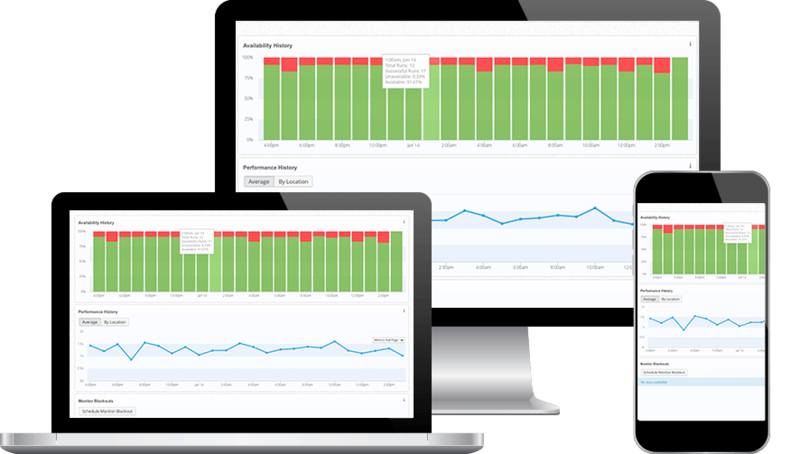 AlertSite bridges the gap between business initiatives and end user experience delivery with in-depth performance metrics, availability KPIs, and functional correctness validation checks so you can meet and exceed user expectations. Point and click to record user transactions across multiple emulated devices using our built in web recorder DejaClick. Proactively monitor mobile web performance across our global nodes running on wireless carriers. Use our API discovery tools to find the internal and external APIs that empower your mobile apps. Continually test availability, performance and functional correctness of back-end API calls through the application. Your users demand seamless app performance irrespective of the devices, locations or carriers. Test your mobile app performance across real devices running across multiple carriers via our partnership with a leading cloud-based mobile testing provider. AlertSite empowers you to get started in mere minutes. Creating mobile monitors is intuitive and almost instantaneous. Point and click to record transactions right in your browser with our web recorder, DejaClick. DejaClick alters the browser’s user agent string and screen size, masquerading your browser as a mobile device to display the mobile version of your website. Run mobile web monitors on emulated devices or real devices, through our integration with Perfecto Mobile. Capture key user journeys and key navigation paths across your mobile site or app to safeguard the performance, availability, and functional correctness of critical steps like logging in, placing an order or checking out. Our built-in recorder DéjàClick records user transactions and creates synthetic monitors with the recorded script without complex and expensive scripting. Get diagnostic information on user experience metrics, detailed load times of each page resource, and page screenshots on error. Our seamless integration with Perfecto MobileCloud offers automated testing on real mobile devices, connected via Wi-Fi or cellular carriers to the Internet, spread in different locations around the world. AlertSite's advanced synthetic monitoring paired with Perfecto gives you an ultimate engine to continuously test the key transactions on mobile devices, and get proactively notified of any availability or performance issues. Monitor from an independent network of over 350 monitoring nodes spread across the world. Emulate user transactions from real browsers, various Tier 1 Internet Service Providers and wireless networks. Monitor from behind your firewall - within your datacenter or private cloud using out private monitoring nodes for your internal mobile websites or applications.